Warhammer 40k Orks (and more): Ramping the hobby back up: Gauntlet Tactical Squad, Primaris Lieutenant. 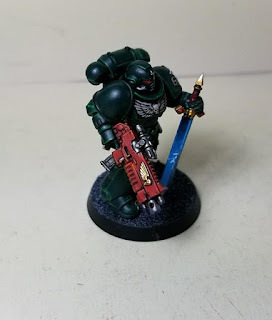 Ramping the hobby back up: Gauntlet Tactical Squad, Primaris Lieutenant. Finally starting to get back into the hobby groove. Finished a full unit of Dark Angels tactical marines, the unit that has the upgrade sprue shoulder pads from the Gauntlet Tactical squad box. I also worked on a Primaris Lieutenant. It's one of the easy to build models that come in the 3 model box with the arm and head from DA Primaris upgrade sprue. I am also going to build up a unit of vets with plasma for with the "weapons of the dark ages" stratagem and a drop pod, converting them from assault marines I built for the old Lion's Blade I was building. Lastly, I'm got a 5 man Dev squad with a single grav cannon. I will swap this out for either lascannons or missiles. Not sure yet. After that I need to save up for a speeder to build a talonmaster and a Darkshroud.